The arrival of spring is a sign that you need to get your patio furniture out and start enjoying the outdoors again. However, you will need to get your furniture ready for regular use before you can put it out on your patio. Even if your furniture was covered for the winter, some amount of spring cleaning will still be necessary as it will have accumulated dust and grime over the winter months. Below is a look at how you can clean different kinds of patio furniture pieces and get them ready for use in spring and summer. Ideally, you will want to clean your patio furniture on a sunny day. Before getting your supplies together make sure that you are going to have lots of sun since your furniture will take time to air dry. 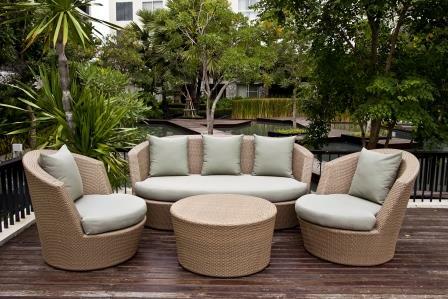 The cleaning methods that you use will depend on the material used to make your outdoor furniture. Wicker, glass surfaces and wrought iron all require different cleaning method. Spray 303 Multi-Surface Cleaner onto the soiled surfaces and scrub with a sponge or wet cloth until the stain is removed. Wipe surface down with a damp cloth to remove loosened dirt and excess cleaner. Rinse your furniture using the hose with spray nozzle and then leave it to air dry. Wipe away any water spots with a damp cloth. Spray down any glass tabletops and then spray with glass cleaner and wipe. If you want to take extra steps to protect your wrought iron furniture from the elements, use 303 Aerospace Protectant. Simply spray it onto the surface and then wipe all of the excess product away. Wiping it away is important to prevent streaking. Buff with a dry cloth to increase the protectant’s longevity. 1. Start the cleaning process by gathering your outdoor furniture cushions, decorative pillows, umbrella and other outdoor fabrics together outside. If possible, unzip the cushion covers and wash them by following the instructions on the tags. You can then use your vacuum cleaner with an upholstery attachment on the cushions. Use the vacuum cleaner to remove any loose dirt and dust. With tufted cushions, you should be careful to run the upholstery attachment along the crevices and seams as well as around any buttons. 2. To remove stains, spray cushions with 303 Multi-Surface Cleaner and scrub with a soft bristle brush or damp cloth. Repeat the process if necessary. Rinse with a separate damp cloth or rinse with water. Dab the cushion with a clean, dry cloth to remove excess water or let air dry. 3. Your next step should be to spray 303 Fabric Guard in a well-ventilated area (preferably 70° or warmer) in a criss-cross pattern directly onto your fabrics until damp. Let your treated surfaces cure for 6 to 12 hours. The 303 Fabric Guard will help them to stay clean by resisting stains and water. Browse our 303® Outdoor Living Products! Thanks for the post. Post is really informative . You can also check our wicker products. And keep sharing such insightful posts.